I have taken all criticisms and made an updated version. Very nice Cyberia! I like the nicknames you gave your Pokemon, is this your team from a certain game? (06-30-2014, 12:17 PM)smoakdragon Wrote: Very nice Cyberia! I like the nicknames you gave your Pokemon, is this your team from a certain game? You can use my real name, everyone else does. Added Bulbasaur to the gallery. Alright, I'm making my request now! 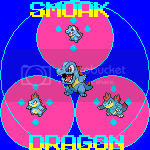 May I have a Totodile sprite that fits the avatar size please? That is all. Took two hours, and I had a lot of ideas, but there you go. Hope you like it! Oh my gosh I love it thank you! Lemme go save it and switch it right now! Requests closed until further notice. Added Megaman and Megaman 2.